I began working on this pastel in early July. It wasn’t going in the direction I hoped so I washed the pastel off and started again. After presenting it to a group, I made changes again as per the suggestions to strengthen the composition. See previous blog entry regarding issues with composition, Using Apps to Determine Edits. 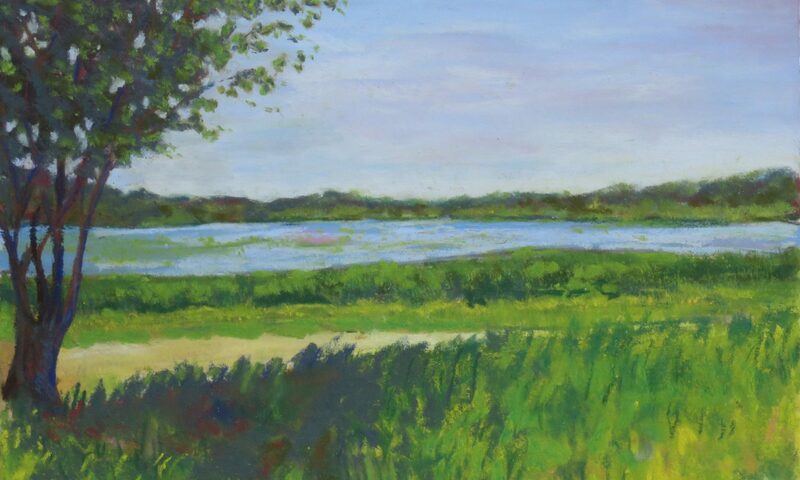 After using my ArtRage app for suggested solutions, I removed a bush appearing in the center of the pastel. If you visited that exact location you would see the bush but it didn’t add anything visually so I removed it from my work. 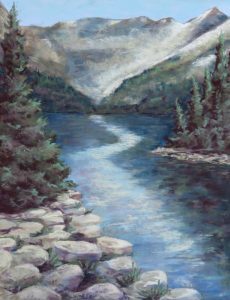 Next I needed to rework the unintentional parallel lines appearing between the rocky path and the reflections in the water. Version of the pastel on September 15, 2018. I shared the photo with friends showing how the piece changed since July. As I posted it, I saw something I didn’t like and made a comment for all to read. A friend replied I was a typical artist, “always making a small change here and there…”. Yes, many times I’ll see a small section and think I could have done it differently or improved upon it. Most times I make the change when I think of it. Right now I will say I’m finished with this pastel (after making that small change of seen in the photo above)…Of course, I’m bringing to another critique so who knows if I’m truly finished!